Milton Bradley proves how in baseball, ‘Love can be blind’.. Yesterday, former Major League outfielder Milton Bradley was sentenced to just over 2 1/2 years in jail for abusing his estranged wife. He had been threatening and physically abusing her for years and, additionally prosecutors had argued that the 35-year-old also smoked marijuana in front of his kids. They have two children and are separated while they are going through their divorce. 1. Bradley tore the anterior cruciate ligament in his right knee in 2007 when he played with the Padres after he was spun to the ground by manager Bud Black, who was trying to keep him away from an umpire. 2. During his brief stint with Seattle, he was suspended for a game for bumping an umpire and ejected for arguing a called third strike. 3. 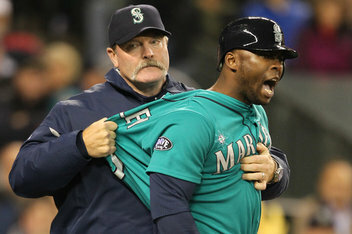 Bradley also received a four-game suspension once for tossing a bag of balls onto the field after an ejection. The real travesty with Bradley has nothing to do with his marriage. No, instead it has to do with the game of baseball, and this is where the scouts, GM’s and owners prove time and time again that indeed, in baseball, sometimes love IS blind. Here is a player that clearly was a bust after being selected in the 2nd round of the 1996 draft by the old Montreal Expos. Bradley only hit 20 or more home runs one time in his 11 year M.L. career. He never drove in more than 77 runs in a season and perhaps even more glaring is that Bradley never played more than 141 games in a season, and he did that only once! Couple his lack of talent with his on and off field outbreaks of temper and lack of professionalism, and one finds themselves scratching their collective heads wondering how nine different teams gave this malcontent contracts in just 11 seasons. That means that nine different teams thought that Bradley had something in his repertoire that would help their club; at least in the short term anyway because the longest stint that Bradley had was with the Cleveland Indians with whom he stayed for three seasons but only appeared in 209 games over that span. ← Who was more of a quitter: Doc Rivers (2013) or Jeff Van Gundy (in 2002)? 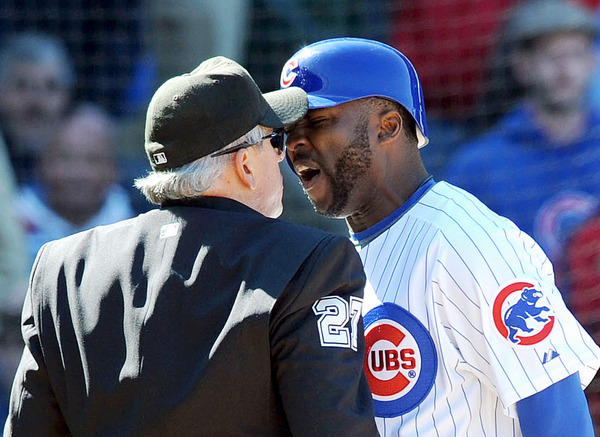 Anger management for a reprobate like Milton Bradley ? I guess not , it`s too late . How did it take 35 years for this guy to end up in prison? Beyond me man! He’s caught some major breaks in his day; the latest was the jail time set at just around 2 1/2 yrs instead of the 7+ he could have gotten. What amazed me, and which was the impetus for the article (more than his behavior) was how he kept getting picked up by a different team almost every season. And it was based on what all the suits THOUGHT he would do but never did. What’s funny is when you consider the old saying about how the best predictor of future behavior is past behavior? Well, how many times did that get ignored in this case? He’s where he belongs now and he’ll probably be even worse when he gets out. That guy has some serious anger management issues. Always has Maurice. That could be one of the reasons why he never reached his full potential on the field.